NITRO-XT ISOLATE is the fusion between the most cutting edge whey isolate proteins: whey protein isolate (WPI) and hydrolyzed whey protein isolate (HWPI), to provide the unadulterated 100% whey protein isolate with best purity (virtually saturated fat-free, lactose-free, sugar free) and the fastest absorbtion in the blood flow. Timing is crucial for muscle building and recovery and this is what NITRO-XT ISOLATE take’s care of the most. Studies have shown that there is a direct correlation at the speed at which amino acids enter the blood stream and muscle growth. The faster you can make this happen, the better your chances are for muscle growth. 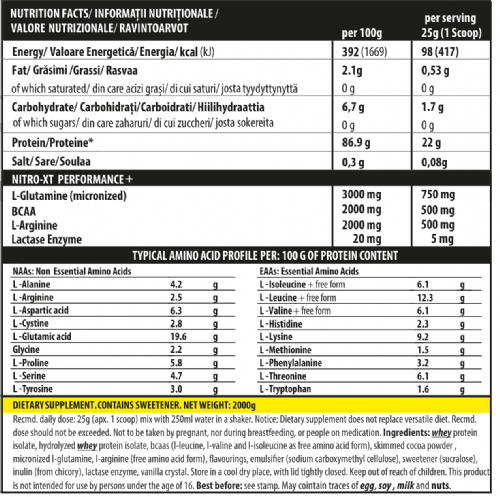 NITRO-XT ISOLATE contains approximative 7.3G of BCAA only per 30g of protein. Hydrolyzed Whey Isolate (HWPI) from Nitro-XT is digested faster because they are pre-digested into peptides, making it the purest, fastest and easily digested/absorbed form of whey on the planet. HWPI digest faster than other whey proteins. Whey protein hydrolysates are insulinotropic. HWPI with easy digesting carbs immediately after training and weight lifting will maximize the recovery benefits by creating a high level of insulin in your blood plasma levels. 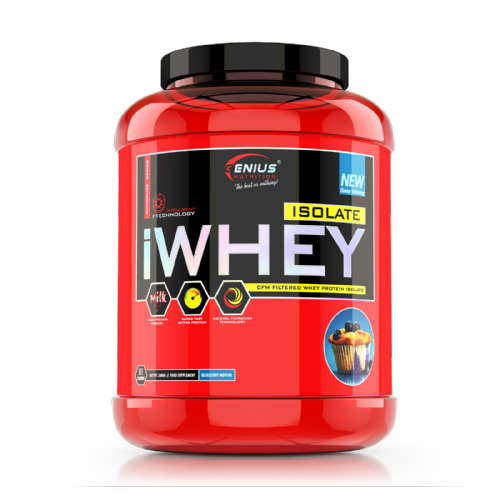 Whey Isolate is ultra premium protein for those wishing to eliminate as much fat, sugars, lactose from their diet as musch possible. Whey Isolate is the next step up in purification using natural filtration, making our protein perfect for individuals who are very sensitive to the low-lactose levels found in whey concentrates. 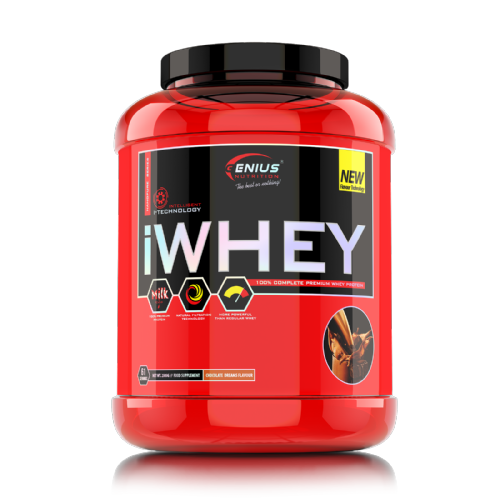 Whey protein isolate has high amounts of naturally occurring amino acids the body needs every day. Whey protein is essential in any nutrition regimen, regardless of age or activity, providing a catalyst to the body for protein synthesis and muscle growth. NITRO-XT ISOLATE have additional added bcaa and glutamine to push your recovery to the next level, because of free leucine will make our Nitro-XT Isolate more anabolic. Mix 1 serving (1 scoop) of Nitro-XT Isolate with 250 ml cold water to prepare your delicious protein shake. As a food supplement, take 1-2 servings daily: on training days consume 1 serving immediately after your workout. Non-workout days take one serving. ALLERGEN INFORMATION: MADE IN A FACILITY THAT USES MILK, SOY, EGG AND NUTS. WARNINGS: FOOD SUPPLEMENTS DO NOT REPLACE A BALANCED DIET AND HEALTHY LIFESTYLE. DO NOT EXCEED THE RECOMMENDED DOSAGE! KEEP OUT OF REACH OF CHILDREN.BEST BEFORE: SEE THE DATE ON THE BOTTOM OF THE BOTTLE.STORAGE CONDITIONS: KEEP OUT OF REACH OF CHILDREN. STORE BOTTLE TIGHTLY CLOSED. BETWEEN 5-30°C (41-86°F). KEEP AWAY FROM DIRECT HEAT, MOISTURE AND SUNLIGHT. DO NOT STORE THE PRODUCT FOR MORE THAN 6 MONTHS AFTER OPENING.